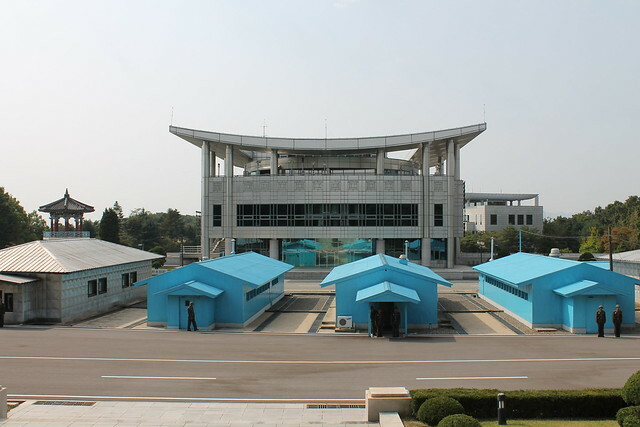 The Democratic People’s Republic of Korea is a unique country. Nowhere in the world will you see so many portraits of the leaders per square meter, nowhere else will you hear so much political propaganda. 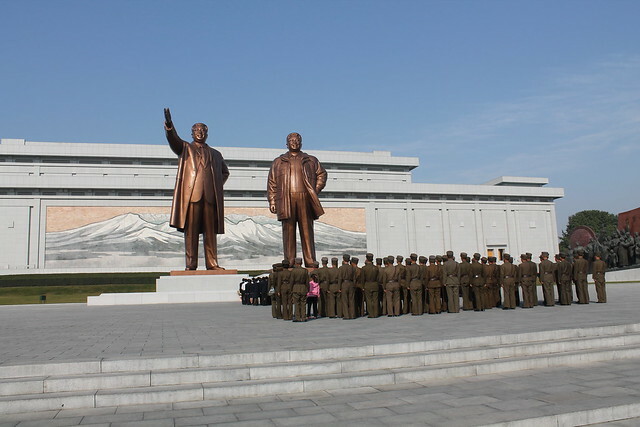 Kim Il Sung and the efforts to scare the world with the nuclear weapon is probably all we know about this country. Well, maybe also kimchi. We decided to go and see for ourselves what this stronghold of communism in Asia is like. Frankly speaking, when we were planning on going to North Korea, I had no idea what places exactly we were about to visit. 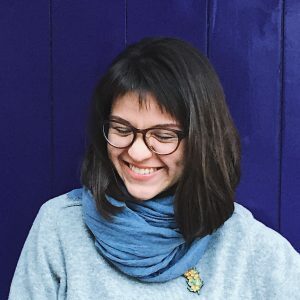 Our trip was fully planned by the tourist company because in most cases you cannot get to the country on your own unless you are a diplomat, a diplomat’s wife or an Orthodox priest. If you are none of those, the easiest way for Russians is to apply to a tourist company in Vladivostok. We got our passports with the visa only in the airport a couple of hours prior to departure. You can buy tickets to the weekly flight Vladivostok – Pyongyang only in the North Korean consulate in Vladivostok and you can only pay by cash. Koreans do not believe in credit cards, and they don’t really have them, for that matter. There were mostly Koreans on board, bringing home huge boxes wrapped in thick black tape so that no one would see what’s inside. However, we did manage to have a peek and see LG and Samsung TV sets inside. So much for “the puppet state” of South Korea! Right after we arrived in Pyongyang we were taken to see the Triumphal Arc built in commemoration of the Korean Communist Party foundation. 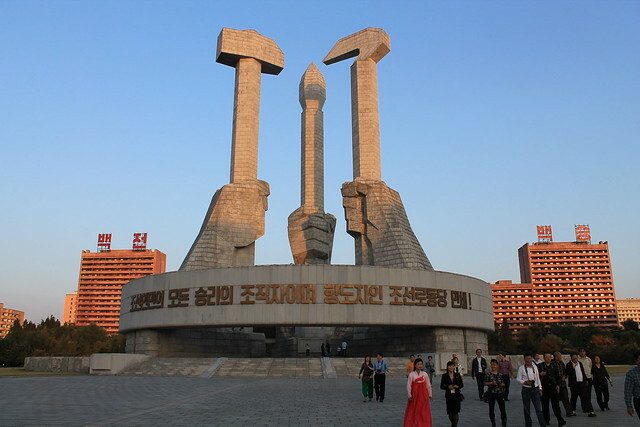 Koreans love numerology: every important monument here is sure to have the connection with the great leader comrade Kim Il Sung, the great leader Kim Jong Il or both of them. 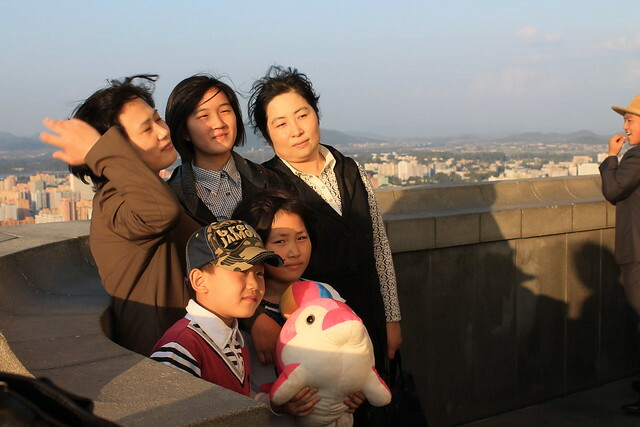 Is the monument 70 meters high? 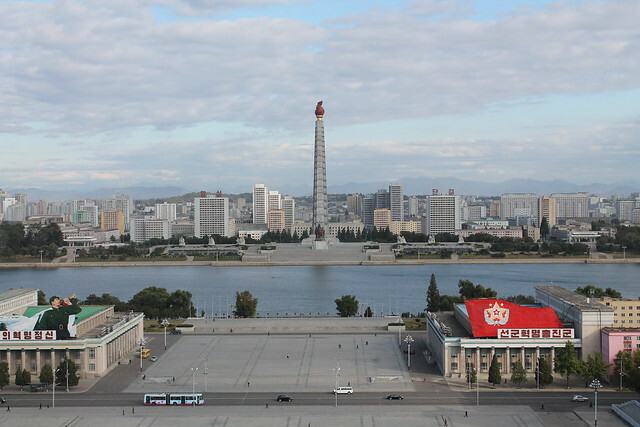 It’s because it was built for the 70th anniversary of Kim Il Sung. Are there 2160 meters between two monuments? It’s because Kim Il Sung’s birthday is on February 16. And so on, and so forth. 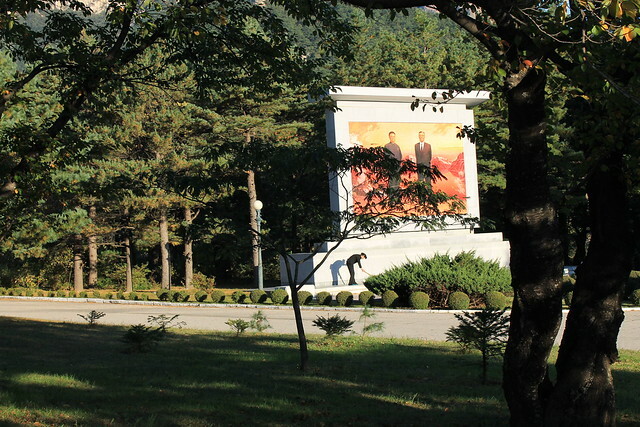 If it’s a monument of both Kims, our guide would remind us to bow down. Koreans themselves do not need any remindings, bowing with diligence and even crying from grief next to Kim Il Sung’s body in the Mausoleum. 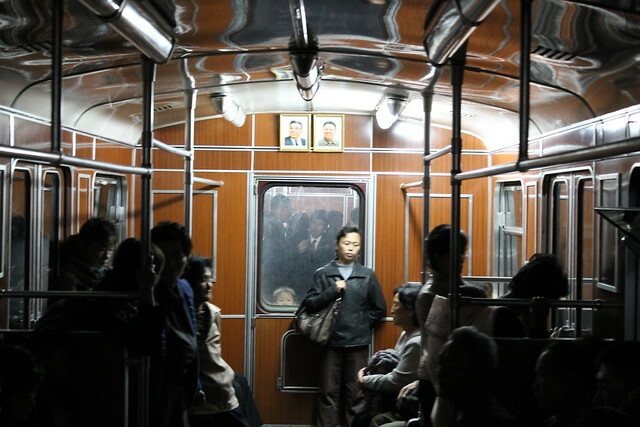 North Korea is full of portraits, pictures and monuments of the leaders: you can find them in every subway car and every apartment, not to mention schools, universities, libraries and offices. -This is the Party Foundation Monument, depicting the Worker (hammer), the Farmer (sickle) and the Intellectual (painting brush). -Well, all three of them are the Military. 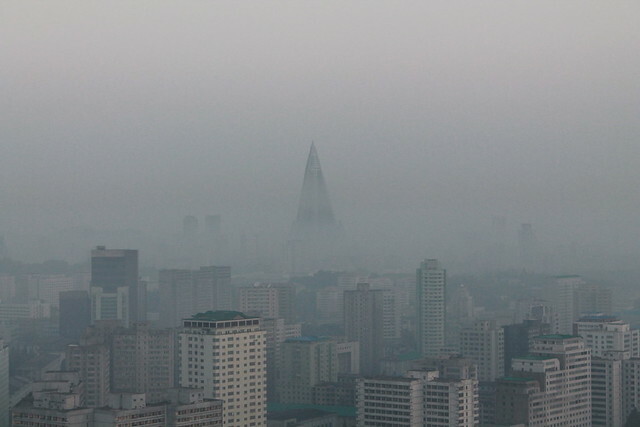 There is lack of electricity in North Korea ever since the Soviet Union broke down, so the country is lit with the dim light of the 40-watt lightbulbs. The portraits of the leaders are in sharp contrast with the rest of the country, lit up so brightly you can see them from afar. Unfortunately, we were not allowed to leave the hotel, so we didn’t have a chance to walk around the town and do sightseeing. 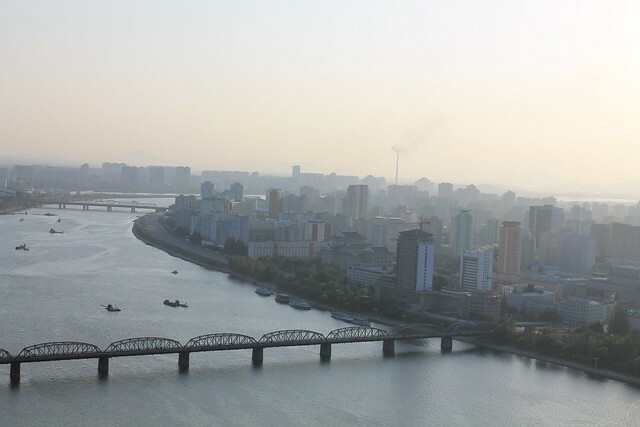 Our hotel in Pyongyang was located on an island, and in this sense, it was very convenient for the authorities to keep us inside: you can’t really run away from an island. 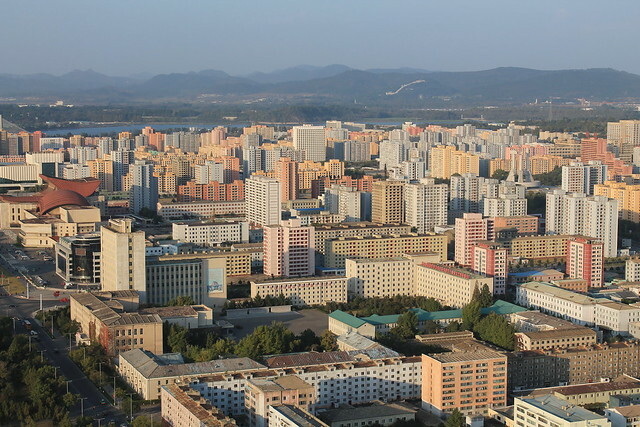 DPRK is a very poor country. The average monthly salary is about $3-4. Alas, we didn’t have a chance to find out how much the food and other stuff cost because as all other foreigners we were only taken to specialized shops where all prices are written in some made-up currency. As we were told, the exchange rate was about 1:100, meaning that there are 100 wons in a dollar (“won” is the name of the local currency). However, in reality it turned out that you can get 7900 wons for a dollar on the black market, meaning that the official rate is 79 times lower than the inofficial one. It’s only understandable that there are just a few tourists in the country. 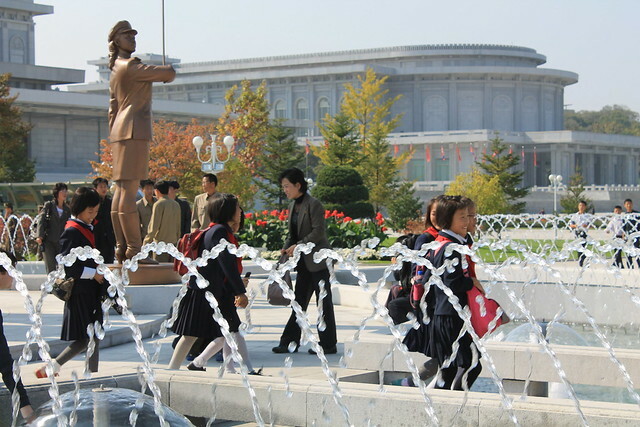 I think we basically saw all of those who were in DPRK at that moment because we were taken to the same places around the country; I would say that there were about 100-200 tourists. It’s not too many for the country with the population of 27 million. 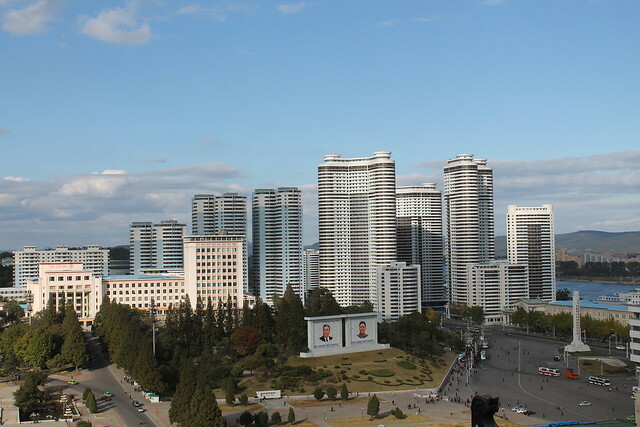 But then there is a 105-storied hotel being constructed in Pyongyang: probably a storey for every tourist? The hotel somehow resembles the Eye of Sauron, especially in the morning fog. Every tourist group is accompanied by three locals: a guide, a “guard” and a driver. 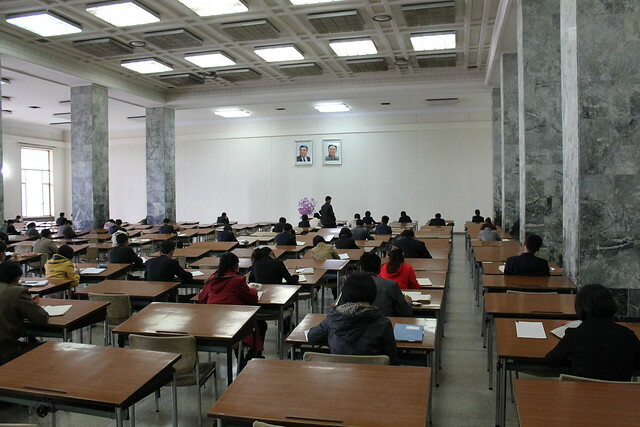 All guides speak the language of their group very well: it seems that the Pyongyang University teaches foreign languages very thoroughly. The “guard” spoke less Russian; his main purpose was to collect us like chickens into one group so that we wouldn’t run away. The driver just smiled all the time and took us from one place to the other; probably he didn’t speak any Russian at all. 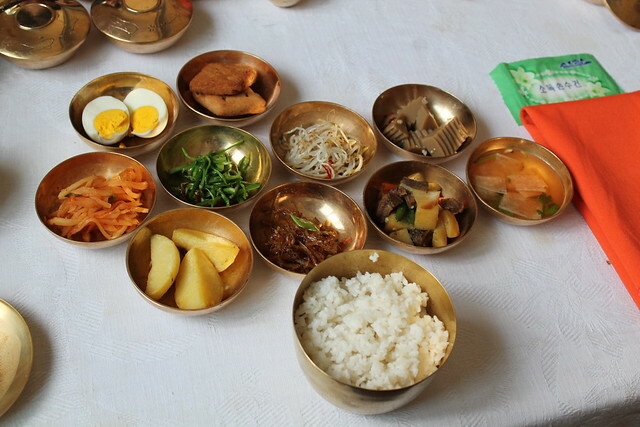 We were fed very well in the hotels; probably they wanted to show us that everything’s going just fine in North Korea. However, it’s rumored that the hotel staff needs to sign a non-disclosure agreement and are not allowed to tell anyone what the tourists eat. You can see for yourself how things really are when they brew one tea bag several times for different tourists and serve powdered milk instead of the real one for coffee. 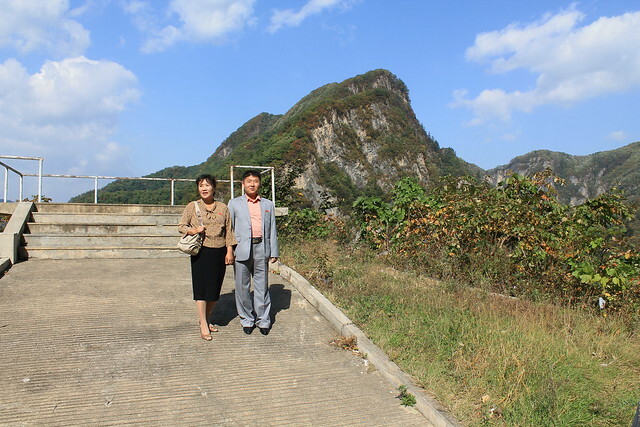 During the time spent in North Korea we didn’t see any cows, sheep, pigs or any other cattle. The only thing we saw were the buffalos that the luckiest farmers use for transporting the goods. Those who are not so lucky have to harness themselves. The locals mostly eat rice and kimchi, judging by how skinny they are. During the past 60 years that two Koreas are separated, South Koreans got some 15 cm higher than their brothers from the North due to normal nutrition. The real economic situation is deplorable: during the week that we spent in DPRK, we didn’t see any combines and only saw five tractors although it was a harvesting season. Everything is done with bare hands: with sickle and scythe. The relations between two Koreas are very special. To be precise, there seem to be no relations whatsoever, although the Northerners use Samsung TV sets and probably even accept humanitarian aid from the southern neighbors. However, when there are foreigners around the government of South Korea is only addressed as “the puppet state government” that sold itself out to the Americans for a piece of bread and reliable partnership. 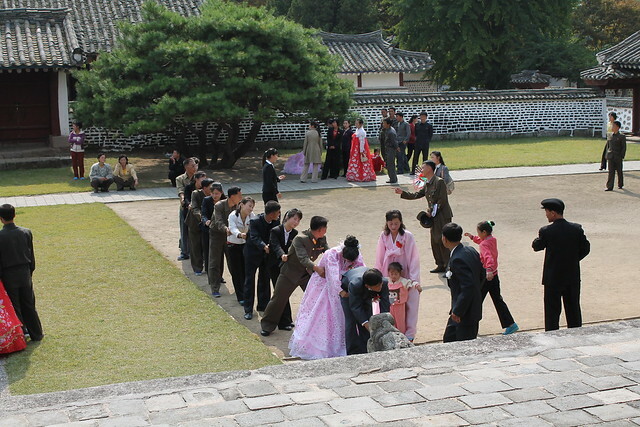 Nevertheless, the separation between the North and the South is taken rather painfully in DPRK. Like South Koreans, they still consider the Korean Peninsula to be one country and hope for reunification sometime in the future. Meanwhile, for now, two Koreas are separated by a 3-meter thick and 10-meter high wall, a minefield, a fence with barbed wire and a 60-year difference in development. The local people mostly look quite gloomy and prefer dark and grey colors in clothing. 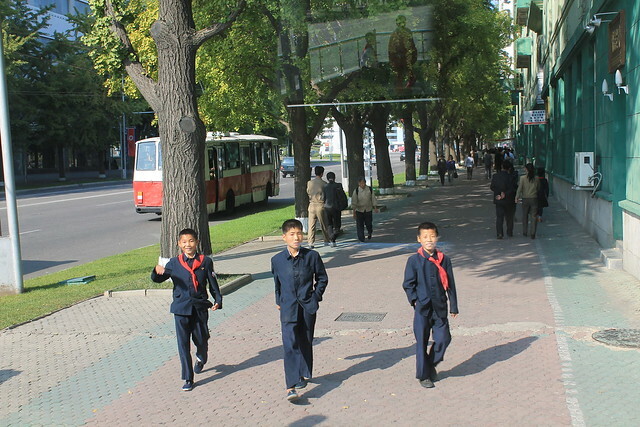 Men especially like suites a la Kim Jong Il: jackets made of a synthetic fabric with a zipper. Some of them put the jackets next to the skin, and it looks a little weird. Women dress modestly: knee-long skirts, wide trousers, opaque blouses. All in all it resembles the Soviet Union in the 1970s. The whole country seems to have frozen in time. Of course, there are some mobile phones of local production, TV, radio and even Internet (only in the state library of Pyongyang and with the special admission though). 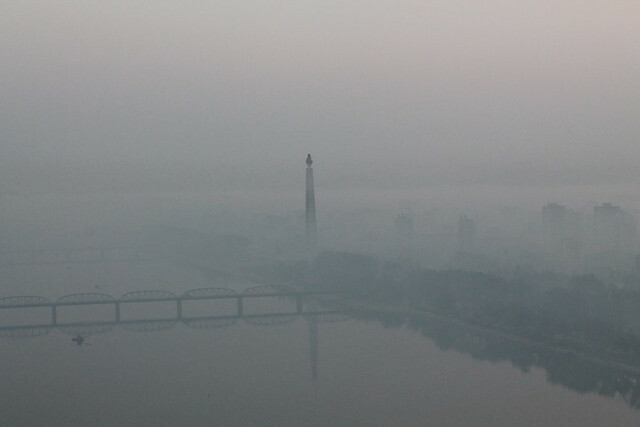 However, during the time in North Korea, I couldn’t get rid of a feeling that I’ve traveled in time to a Soviet town. There are a few cars in the capital, not to mention the countryside. 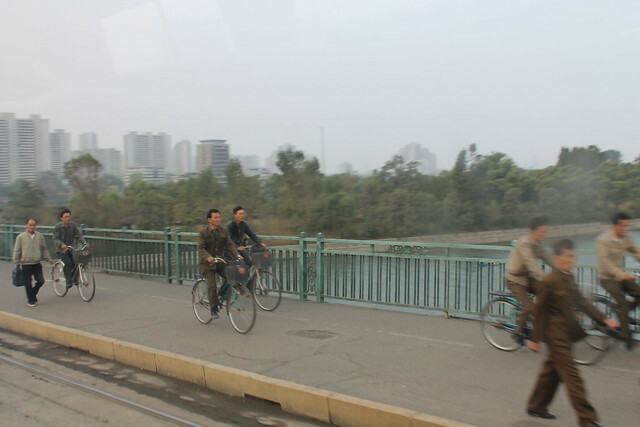 The most popular means of transportation in North Korea is a bicycle, and it’s used just like a regular car: to get from one place to the other, carry goods and children. 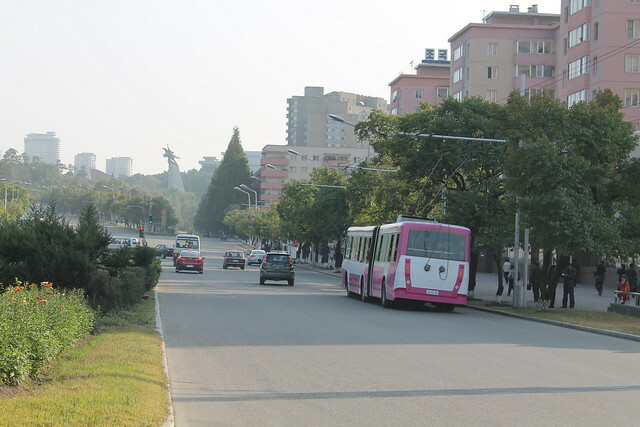 There are buses, trolleybuses and trams, and Pyongyang even has a subway. Political propaganda haunts you everywhere you go. 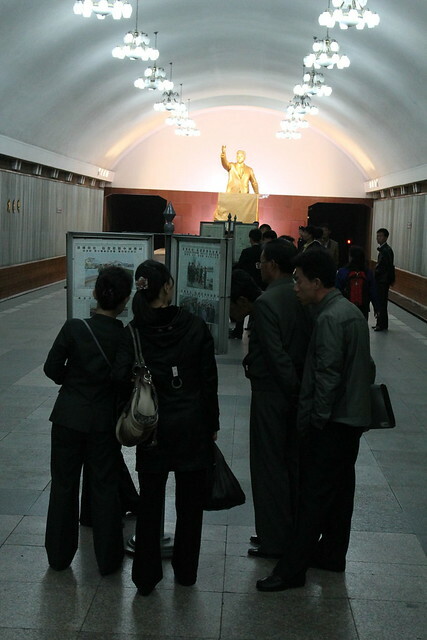 The Party managed to even make the locals go to bed and wake up with the thoughts fixed on the glorious leaders: as I have already mentioned, there are portraits of Kim Il Sung and Kim Jong Il in every apartment. You can find the stands with fresh newspapers in the subway. Unfortunately, I don’t read Korean but I could easily guess what the newspapers were about. Every North Korean has a badge with the portraits of the leaders pinned to the jacket or dress, and if he was unfortunate to leave it at home, he will be told about it and will need to go back home to get it. You cannot simply buy a badge with the leaders; they are given out at schools, universities and at work. 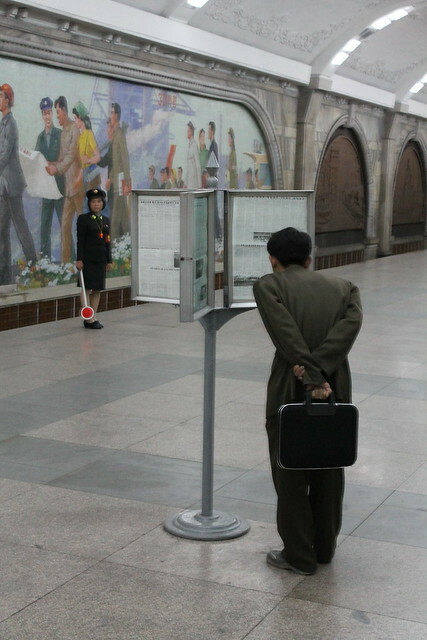 Regular North Koreans require a visa to get to Pyongyang. Neither can they move to the capital: they either need to be born there or move for studies at the university. 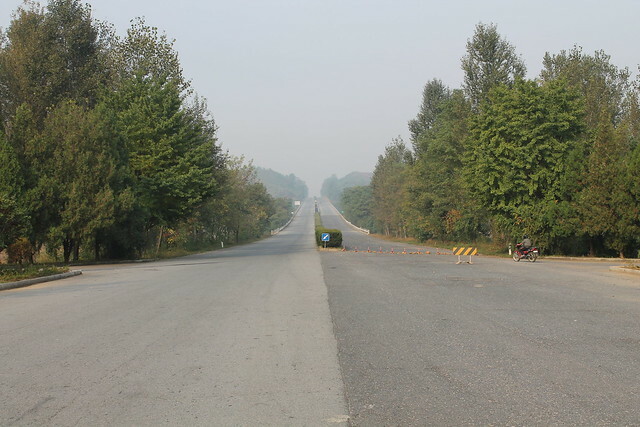 The roads close to Pyongyang are full of block stations where the documents are checked. When we played fools and asked what the block stations are for, the guide told us that there are many wild animals, specifically tigers, in North Korea, and the block stations are needed for protecting people from the predators. When reading my story about North Korea you might think that our trip didn’t have any good sides to it. That is not entirely true. 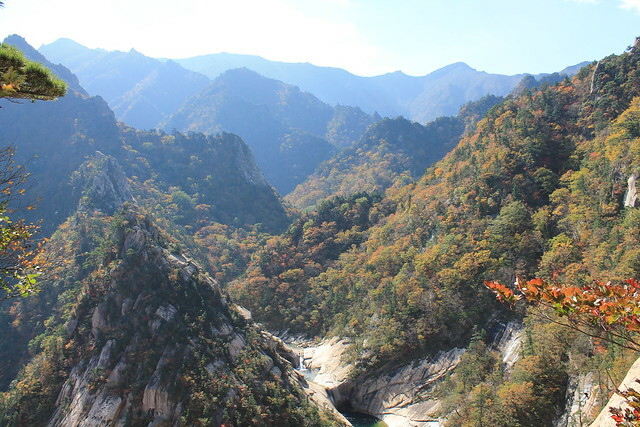 For instance, the nature of North Korea is stunning with the seas, mountains, canyons, waterfalls and gorges. 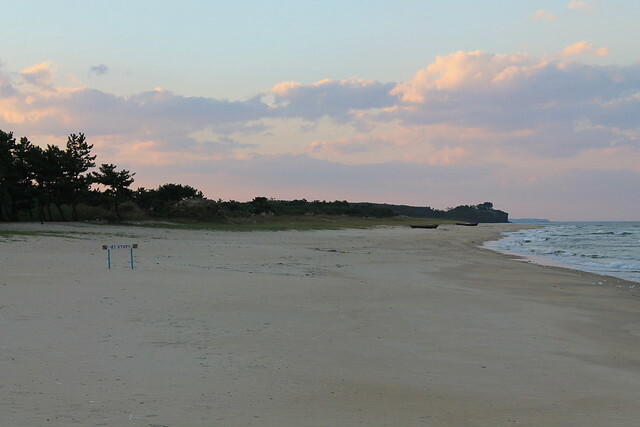 However, when you see that the sea is fenced with barbed wire so that the people wouldn’t swim away to another country, and the beaches are virgin clean with no human traces, it makes you quite sad. 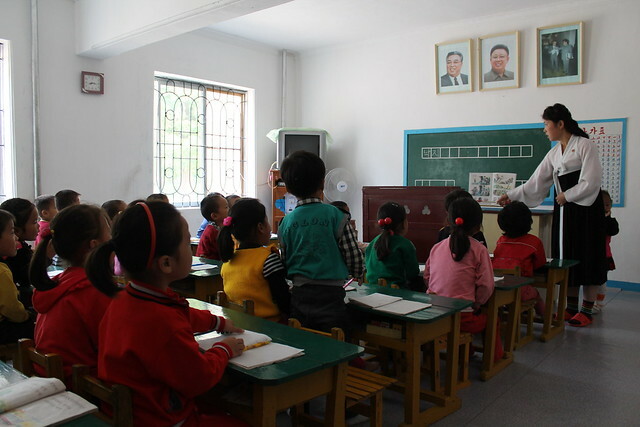 North Koreans are very friendly: when they see foreigners, they smile and sometimes even wave their hands, especially children. They are very hard-working (though they only have one day off per week – on Sunday) and quite inquisitive. It was a real pity that I couldn’t speak Korean because otherwise, I would be able to speak to them directly (provided that I would be allowed to, which is highly doubtful). This country makes you very depressed. 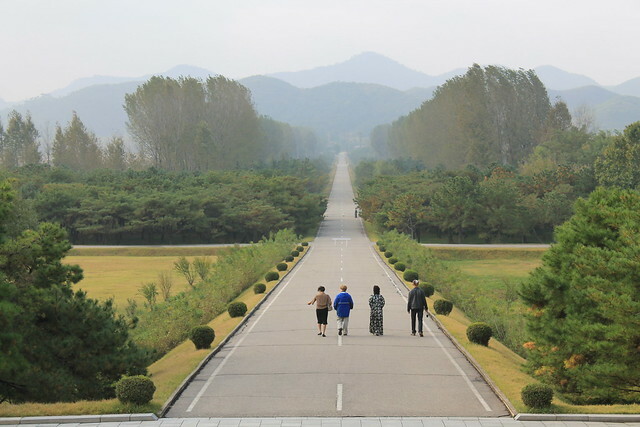 I can’t say that I would like to go back one day but I really want to see what happens to DPRK if the North and the South ever reunite. For the Russian version of the article click here.